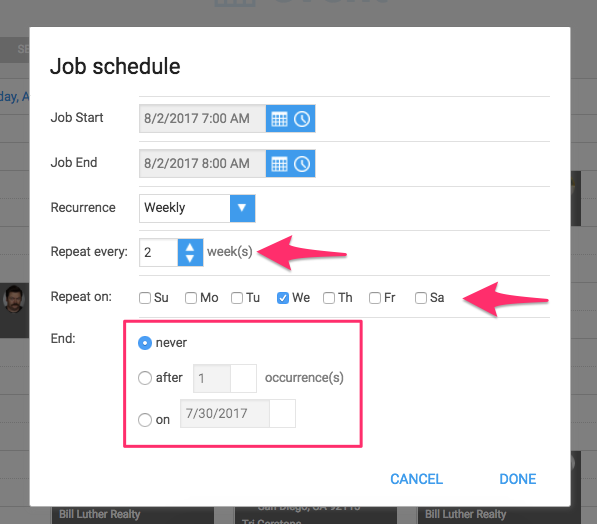 How do I create a recurring event? Setting non-job events, such as weekly meetings, time off or appointments, to reoccur in your calendar is simple! Create it once and you're good to go. Start by creating an event as you normally would. 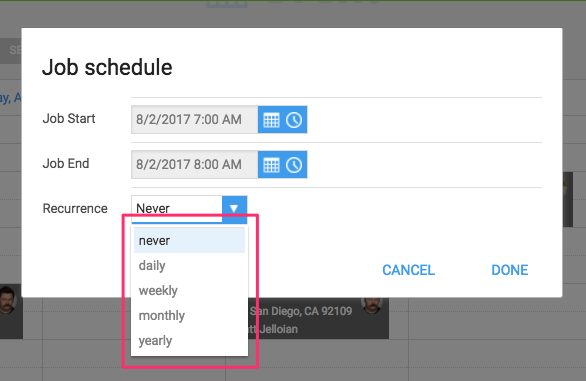 When you're on the schedule screen, click the 'recurrence' button above the calendar. A window will appear that will allow you to choose which interval you'd like the event to reoccur on the calendar. Click 'Never' next to recurrence and you'll see a drop down menu. You can then choose how often it will reoccur, which day of the week the events will fall on and if you need the event to end. The end series can be a specific date or after a certain number of occurrences. If you need an event to reoccur biweekly, choose 'weekly' and adjust to every two weeks. Once the event is set to occur at the correct rate, click the 'done' button in the bottom right. Then hit the 'back' button int he top left and the 'save' button along the bottom of the screen to ensure your event has been saved!